As I am starting to look forward to blogging more and doing more reviews of what I’ve been reading, I’ve decided to also add a weekly Waiting on Wednesday post to highlight upcoming YA releases that I’m excited about. By the time you read this post, the book that I’m desperately looking forward to getting my hands on will no longer be in pre-publication status. It will, in fact, have been published the day before. -BUT- I work for the public library, which means, it may be a little bit before this lovely book falls into my hands, so I’m saying it still qualifies. Playing with the concept of revival will always be interesting to me, as I was fascinated by stories like Frankenstein from an early age. The idea of a gangster receiving a second life and experiencing notable events throughout history has me ready to grab this book as soon as it hits the shelves. If you happen to get to read it before I do, I hope you’ll post your opinions. 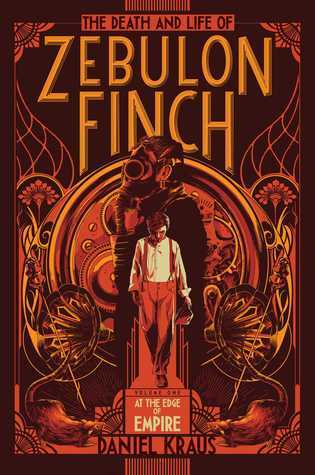 I have high hopes for Zebulon Finch, and I can’t wait to see if they are met. This entry was posted in Waiting on Wednesday and tagged amreading, author, books, daniel kraus, death and life of zebulon finch, new, newreads, publishing, reading, review, upcoming, waiting on wednesday, waitingonwednesday. Bookmark the permalink. This one sounds really different than anything I’ve read before. sounds good!